Tori tori restaurant, Studio ESRAWE verde360 | Photo: Raúl Rivera, NYC, Courtesy of Rojkind Arquitectos, México D.F. 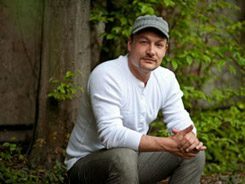 Andreas Schmidt of the Trier-based Indoorlandscaping agency uses plants and imagination to give modern buildings a more pleasant feel. “Either you’re part of the problem or you’re part of the solution or you’re just part of the landscape“, according to actor Robert de Niro in the film “Ronin“ that was made in 1998. This quotation is used as a slogan on the website of Indoorlandscaping managing director, Andreas Schmidt. Perhaps to emphasise his role as a designer of creative and ecological solutions in a jungle of lifestyle trends? But let’s start at the beginning, when a strip of turf was flipped upright by the young Indoorlandscaping designers at a trade fair booth for the tech company Siemens, back in 1998. The idea worked, this vertical lawn was a real eye-catcher. Living, fresh green, a treat for the eyes, lungs and mood. The chemistry graduate come designer realised that this concept had potential. indoorlandscaping.BOA.BRIDGE PERSPEKTIVE | © indoorlandscaping.com Architects generally consider small pot plants as boring, bourgeois and suburban. Schmidt came up with an answer that met the expectations of his customers. 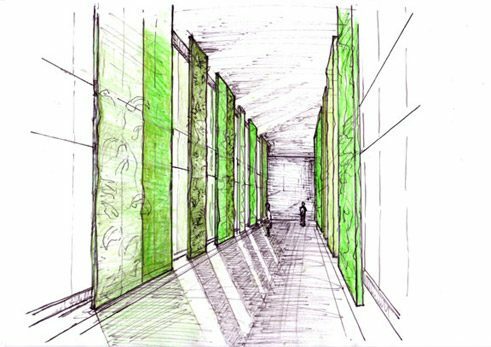 Designed in tune with their specific needs he brought in plants on a massive scale, incorporated cascades of foliage in courtyards, implemented monochrome planted walls and created avenues of slender alders behind metre-high glass facades – a modern approach to the back-to-nature movement. Green foliage now filters daylight to create a calm, sensual contrast within the stern ensemble of glass, steel and concrete. It is projects like this tamed wilderness that break up conventional conceptions of plants in buildings. Portrait Andreas Schmidt | Photo and © Marco Piecuch “It’s mostly operators of open plan offices, banks or hotels who decide in favour of new interior planting schemes. The words “Corporate Green” emphasise a company’s sustainable approach”, Schmidt adds. Instead of choosing a masterpiece of art for representation purposes, some banks and executive boards go for green art. 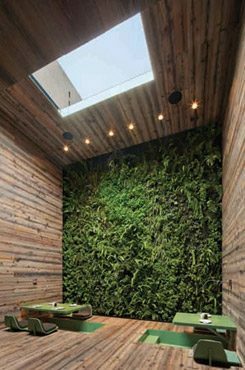 “A creatively and visually designed green zone is not a mere accessory, it is a design element with added value – it affects and cools the room climate, helps people to relax based on its colour, and stands for a calm, slowed-down approach “, says Schmidt who took advanced studies in alternative medicine, naturopathy and homeopathy. “Plants alter acoustics in space, and peat, for instance, absorbs and bonds dust. But first and foremost we see ourselves as designers, Schmidt comments. His team is now planning large projects such as sky gardens for high-rise buildings or multi-storey gardens for shopping malls – often these are installations that vary between works of art and natural air conditioning. 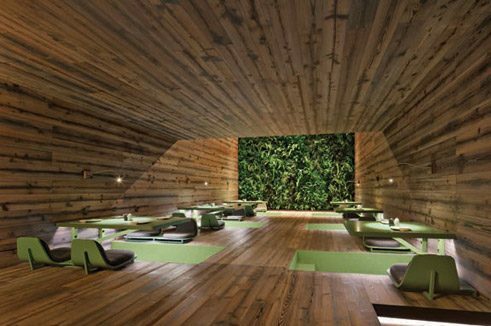 Tori tori restaurant, Studio ESRAWE verde360 | Photo and © Paúl Rivera, NYC, Courtesy of Rojkind Arquitectos, México D.F. Towns built with large amounts of concrete are places where companies like Indoorlandscaping can thrive. Andreas Schmidt’s projects fill a static niche with life, they form the missing link between architecture, interior and landscape architecture. The agency that operated from bases in Trier, Munich, Los Angeles and Mexico City worked for such as Amsterdam-Airport or the Bank of America and employed specialists in a variety of disciplines: designers, biologists, light designers, engineers and landscape architects. After many talks and presentations in cities such as Copenhagen, London, Singapore and Bologna, on the value added offered by his green “co-inhabitants” in highly engineered environments, Schmidt now sees his task as done. After 15 years as a promoter of green landscapes in urban space, he is looking for new challenges. Franziska Horn has a university diploma as a designer and writes as a specialised journalist focusing on the fields of design and modern life.